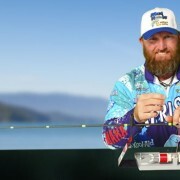 Learn a simple way to take your rod’s ferrule wraps from plain to impressive in no time. Ferrule wraps add a little extra protection to ferrules of multi-piece rod blanks. 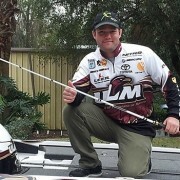 Many rod builders also use ferrule wraps as an opportunity to customize the fishing rod even further. Check out this simple guide to wrap your own creative ferrule wraps! First step, pick out your primary wrapping thread and accent thread color. Considering how many colors and styles of thread are available in ProWrap Thread, the only limits for your decorative ferrule wrap is your own imagination! Next, slide the CRB-Extension Tool into the rod blank section and position both in the HWS-1 Hand Wrapper with the ferrule you intend to wrap aligned in the middle of the wrapper. 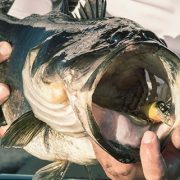 The extension tool is a must for building multi-piece fishing rods because you can use it to center ferrule wraps, or even chuck it up in your rod dryer to finish your guide wraps. The HWS-1 uses an orange tension rod to maintain the thread wrap as you go, but make sure it is either pointed at your chest or at the rod blank. If the tension rod is pointing towards the ceiling, your wrap will be too loose. On the other hand, if the tension rod is pointing down too far, the wrap will be too tight and risk damaging the surface of the rod blank. For the third step, begin your thread wrap! Once you’re ready to add the accent thread, slip it in under running thread so it is secure. Then, lock it down with 4-5 more wraps of the running thread over the accent thread. Next, wrap both the main and the accent thread side by side to create a stripe pattern. Continue wrapping both side by side until you are satisfied. TIP: Remember to burnish the thread wrap as you go to remove any visible gaps in the wrap. When you’re ready to finish off the stripe pattern, slide a loop up under both running threads and wrap over it 3-4 times to hold it in place. With the loop in place, slip the main thread through the open loop and pull both back through the thread wrap. Since only the accent thread is left as a running thread, trim off the tag end of the main thread and the tag end of where the accent thread first started. Then, continue wrapping the accent thread around the rod blank to your desired length. As you reach your desired length for the thread wrap, slip another thread loop underneath the running thread and wrap over it 4-5 times to hold it in place. 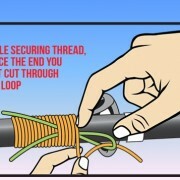 Slip that running thread through the open loop and pull both back through the wrap to lock it in place. TIP: Use a new thread loop each time to prevent the used, frayed threads of past loops from costing you a quality thread wrap. Finally, trim off the last thread tag and start prepping your epoxy to finish off the thread wrap! 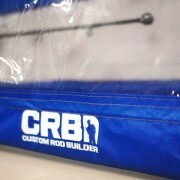 Wrap Wednesday’s are a great resource for new and experienced rod builders because they make the instructions fast and simple. That way, you can start customizing your own thread wraps in under a minute too!